It’s perfect in Paris, but you need planning and patience for longer trips. The Renault Zoe doesn't grab EV headlines like the Nissan Leaf, Chevy Bolt and Tesla's Model 3, because it's not sold in the US. But with a 41kWh battery that can propel it 300 km, a €23,700 ($29,000) starting price and zippy performance, it's worth learning about the French-made car. I took it on a tour in and around Paris to check out not only the EV itself but France's entire charging network. Cars like the Zoe and the infrastructure are going to be crucial, because the city of Paris plans to ban gas-burning cars by 2030, with the rest of the country following suit by 2040. With all that in mind, I decided to see how useful the Zoe is on short trips, longer trips and driving in Paris. At the same time, I was able to check out the charging network in France and see how easy and time-consuming it is to make trips in the car. Renault managed a neat feat of engineering with the 2017-18 Zoe Z.E. 40, nearly doubling the battery size from the previous 22kWh model while fitting it into the same space and adding just 15 kilograms (33 pounds) in weight. Owners of the older model can even upgrade to the 41kWh battery. "If you look at how the Zoe has evolved, going from 22kWh and, just two years later, 41 kw in the same box with just a $1,500 price increase, you can see the massive price drop and increase in density for the industry," Renault EV director Eric Feunteun told Engadget. The Zoe has a few things in common with its alliance-mate Nissan Leaf, which is the best-selling EV in history with more than 300,000 units sold. They don't actually share batteries or any other components -- at least, not yet -- but both the 2018 models have 40kWh batteries. They also have around the same range, though Renault claims its EV can go a bit farther in real-world usage, around 186 miles (300 km) compared to 150 for the Leaf. That's highly dependent on the weather and how fast you're driving, though. I started my trip in Paris, and drove to the countryside via the autoroute (freeway) about 93 miles away, after starting with about 80 percent battery power. It sounds simple, but this trip was quite an eye-opener about how EV range works. That 186-mile range only applies to city driving at 20 degrees C (70 F). On the autoroute, at 81 mph (130km/h) you can only expect to go between 93-100 miles (150-160km), and fewer if it's cold. Consequently, unless I really wanted to take a risk, I needed to recharge somewhere in between. The Zoe is equipped with Renault's R-Link system, which handles navigation and entertainment chores. The "Z.E. Link" function can find you a charger on your route and guide you there. I discovered, though, that you can't really rely on it -- you have to plan carefully and figure out where all the stations are if you don't want to get stuck in the middle of the freeway. After following the R-Link to a Renault dealer to get a charge, I discovered it was closed. I wasn't able to activate the charger myself, so had to fall back to a "Plan B." (I didn't have a Plan B.). Luckily, I had downloaded a third-party app from a site called ChargeMap, which finds chargers from all available networks, not just those directly supported by Renault. It quickly located a fast, 43 kW "Sodetrel" charger run by French power giant EDF, just a few miles away at a Shell station. It took me about a half-hour to sign up and figure out how to work it. After about 40 minutes, the battery was up to 80 percent -- easily enough to get me to my destination. After the Shell station recharge, I arrived at my destination with around 22 percent power. Once in the countryside, I was forced to use a household outlet (230 volts in France) with the supplied adapter. That takes 24 hours to get you to a full battery, but the next morning, around nine hours after plugging into a regular wall socket, I was already back up to 80 percent. The Zoe is marketed as a smaller, second car meant for short trips and tooling around town. To that end, most buyers elect to spend €1,000 or so installing the Wallbox, Renault's answer to Tesla's Wall Connector. Options are available from 7.4 kW to 14 kW, the latter of which can get you charged in four to five hours. A full charge consumes around 50-60 kWh, or around 7 to 8 euros' worth of electricity in France. The next day, my spouse and I elected to do a trip of about 100 miles (150 km) heading to a city known for its white wine, Sancerre (yes, my spirit emoji is a glass of wine). This is a typical trip for rural French people, both for work and pleasure. My wife's hairdresser, for example, travels to clients' homes in an older 22kWh Zoe with half the range, then charges up at night with no stress whatsoever. The Zoe is a hoot to take on small road trips: It's quick off the line, maneuverable on the twisty French country roads and comfortable. The car handles bumps and corners well, though the electrically-assisted steering lacks in feel. I was able to connect my smartphone via Bluetooth and listen to and control Spotify while navigating using the R-Link system. My only complaint with the latter is that it's laggy. When we arrived that evening, the car had nearly 50 percent battery life, and an overnight charge-up on domestic power got me to a full battery. The entire Sancerre trip showed just how useful and stress-free the Zoe is for short weekend jaunts and daily commuting. The next day, I could have made it back to Paris traveling on a two-lane highway, but it would have added an hour to my trip. Instead, I elected to again take the autoroute and charge up for a half-hour. Renault has found that owners do 90 percent of their charging at home, so it chose not to go for rapid DC charging. All Zoe models use the same battery, but one model supports rapid AC charging up to 43kW, and the others can handle half that. Tesla EVs, by comparison, can take a 145kW DC charge. "We have pushed for the AC charging because we consider it a strength of our car," said Feunteun. That's because AC chargers are five to six times cheaper than DC models, he points out, so it's easier to persuade supermarkets, service stations and other businesses to install them. That, in turn, makes it easier for consumers to find a charger. 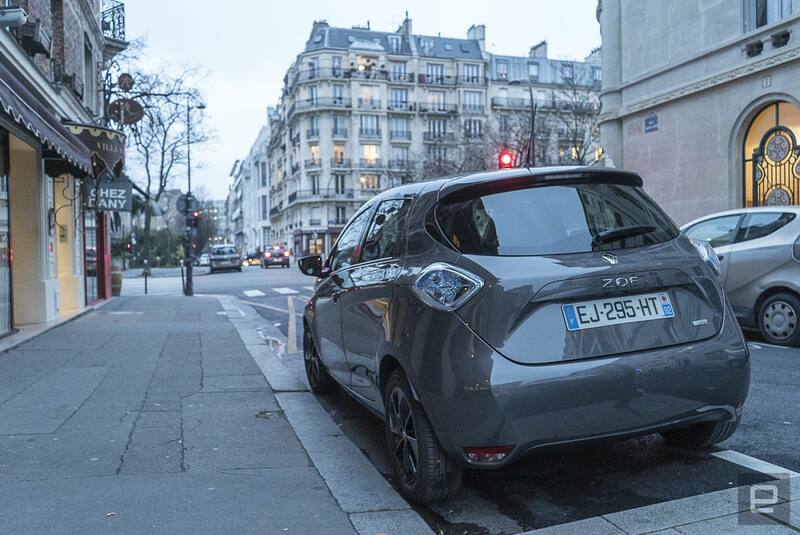 It also jibes with the Zoe's mission as a city runabout that can be charged from household AC power. On the other hand, if the Zoe supported full 150kW DC charging, you'd be able to charge it to its full 186-mile range in just 20 minutes, making it infinitely more useful on the highway. Shell has promised to install 80 350kW chargers in Europe, and other operators are considering it, too. Tesla, Porsche and Honda are just a few of the EV makers promising to support that kind of power. Renault has also said that it will offer DC charging in future models, though it didn't specify which power levels it would support. The company told Auto Actu that for 2019 Zoe models, it would back the CCS Combo 2 DC standard that has been widely adopted in Europe by BMW, GM, VW and other automakers. I left the countryside in the afternoon, and about halfway to Paris, ended up at another Sodetrel charger, just ahead of a Nissan Leaf owner who had his eye on the same one. He owns both an older Leaf and 22kWh Zoe, so we chatted for a few minutes while he charged up. With several years of experience under his belt, the Leaf owner told me that both the Zoe and Leaf work perfectly as daily city drivers. Long trips are a lot more complicated, though, as some regions have better coverage than others. "The Sodetrel network is good, and you can usually find fast chargers at supermarkets like Auchan, Lidl and Intermarche. However, there are zones where there's nothing," he said. "When I traveled in Alsace, I passed through a city where there was only one charger, at a Renault dealership. It took a good hour before I had enough power to go to the next charger." He added that he only takes the EV on long trips when he's alone, as it's a pain for his wife and kids. I arrived back in Paris with 62 miles (100km) of range. In the city, the Zoe is once again a delight to drive, thanks to its zippy acceleration, maneuverability and much better range. That's in large part due to the impressive regenerative braking, which can give you back the equivalent of up to 15-20 kW when you lift up on the gas pedal, depending on your speed. We don't have a garage in Paris (I usually take the train), but parking and charging an EV is not a big problem. Renault's Z.E. Pass gives owners discounts at rapid charging stations from Paris network Belib and others. You can also buy a charging pass from Autolib, the city's EV car-rental network, for €15 an year, and pay €1 an hour for the first hour, and €3 an hour that. Evening rates are capped at €6 a night. The other major network, Belib, has roughly the same rates, but charging and parking with Belib in the evenings are free. However, some EV owners feel that Paris isn't quite doing enough, considering its ambitious 2030 timeline to ban ICE (internal combustion engine) vehicles. Autolib recently jacked up its prices and reduced the period for capped night charging, giving residents a bit less incentive to keep an EV in the city. On the other side of the coin, many Parisians feel that the city is taking things too quickly under Mayor Anne Hidalgo with its plans to eliminate ICE cars, creating a lot of cost and inconvenience to workers, residents and others. As for pricing, the Zoe starts at €23,700, but the Edition One model I tested was €28,300, or around $34,000. French EV buyers get a €6,000 government credit, making the top model €22,300 ($27,300). However, that's not the entire story of the Zoe's price. You must also lease the battery at €69 ($80) a month with just 7,500 km (4,700 miles) of usage allowed per year. If you want unlimited kilometers, that rises to €119 ($145) monthly. With the rebates and battery rental taken into account, the Zoe is a bit cheaper than its Nissan rival, the Leaf, in France. Feunteun admits that price sensitivity is part of the reason Renault leases the battery but adds that there are benefits. "Our experience is that if you include the battery, the customers will not pay that price for a [small] car," he said. "And it's much easier for the customer if there is a battery problem. We just swap it for another so they don't have to wait for their battery to be repaired." The Zoe has been available since 2012, and thanks to the experience Renault has gained since then, it actually makes money -- unlike other EVs. "We were not profitable at first, but what we have achieved already is to be marginally profitable," Feunteun said. "For the second generation, we aim to reach positive profitability." Despite a few setbacks, I had a great experience with the Zoe, feeling that it could handle the majority of my auto needs in the city and for short trips. Long trips would be more of an adventure, requiring a lot of planning and a certain zen attitude. As for problems,I found Renault's estimate of the Zoe's range a bit optimistic. It's probably a bit more than the Leaf because it has a slightly bigger battery and 100 kg (220 pounds) less heft. But I'd put it at more like 160-170 miles, rather than 185. The charging network in France is the second largest in Europe, with around 15,000 public stations, compared to 16,000 in the US and 210,000 in China, for some perspective. But owning an EV requires a lot more planning than with a regular car. Until the government and private companies make it easier to find, navigate to and pay for charge-ups, regular French folks won't go for EVs, even if the operating costs are the same or a bit less. As for owner costs, Renault figures that it's now on par with comparable ICE vehicles if you take everything into account (fuel versus electricity, lower maintenance on an EV, leasing the battery, etc.). All told, I really liked the Zoe, and if I was in the market for a new car (I'm not), I'd probably buy one. If I did, I'd strongly consider getting solar panels to reduce charging costs, too, because France is also a solar-panel-friendly nation. It's not just because of the money -- it's become increasingly important to me to reduce my carbon footprint. Using an EV in France would help, because well over 90 percent of France's electricity comes from carbon-free sources, mainly nuclear power. So, with the new regulations looming in France, I might as well get used to driving on electrons as soon as possible.